The Little Red Schoolhouse Nature Center has a rich history that dates back to 1886. 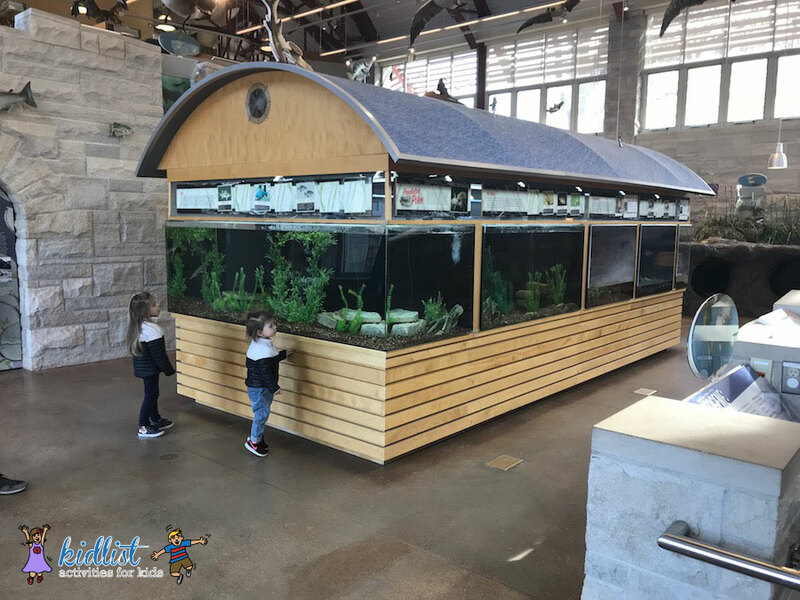 At this nature center, you will not only have the opportunity to engage in its historical pride, but you will also be able to enjoy the newer visitor center that teaches and engages children and families about nature conservation. 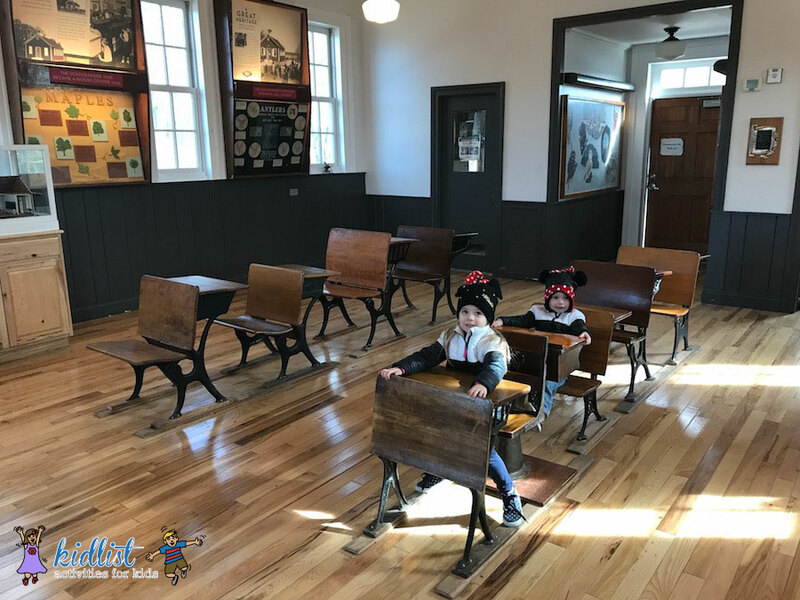 Visiting the Little Red Schoolhouse and walking the trails is a rite of passage for all children in the nearby southwest and west suburbs! Check the website for up-to-date hours and holiday hours. The visitor center is a large, modern building with live animal exhibits of reptiles, fish, birds, and insects. It also boasts a large display of taxidermy that gives children a chance to see larger larger forest animals more closely than if they were caged. The visitor center has a very large children’s play area with books, puzzles, logs for building, and more. 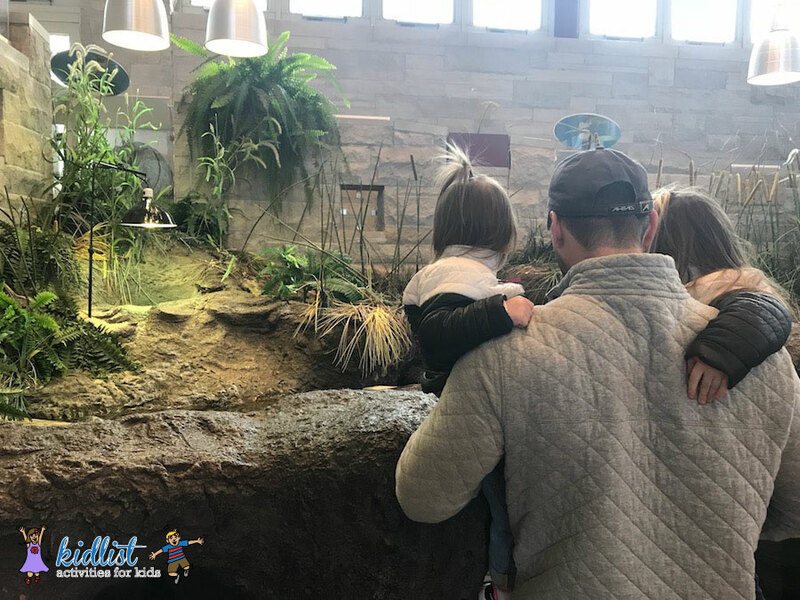 The visitor center is the perfect place to take your children during all seasons. During the winter, there is enough to occupy 1–2 hours of time. 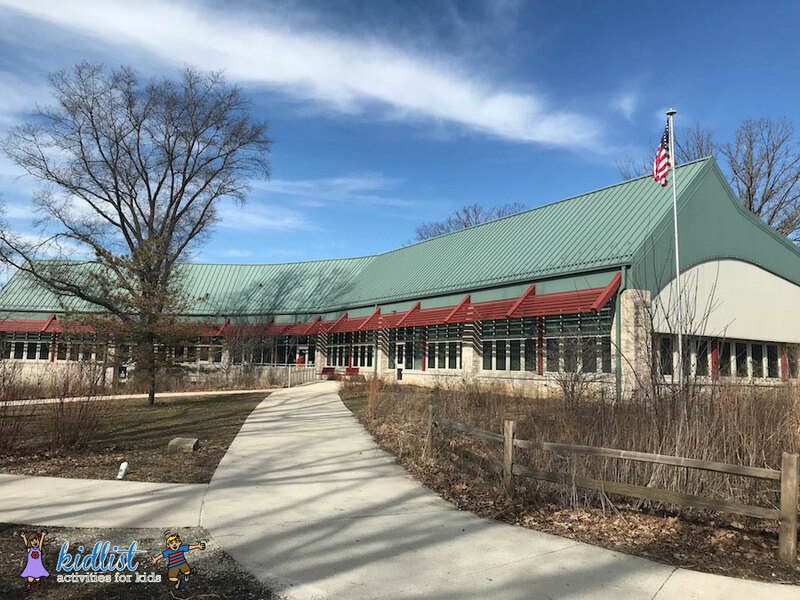 During the warmer months, you could stay much longer and explore the three surrounding trails associated with the nature center or venture out to one of the connecting trails associated with the Cook County Forest Preserve. The Little Red Schoolhouse has more to offer than the visitor center. You can and should actually visit the building where this center received its name. The old schoolhouse has maintained its charm by being set up as a classroom may have been. My children took turns playing teacher and student in the antique wooden desks. The Little Red Schoolhouse also has three trails that surround the property. These are great for exploring as the weather turns warmer. The trails range from approximately 15–45 minutes in length. Please note, they are to only be used for walking and pets are not allowed. 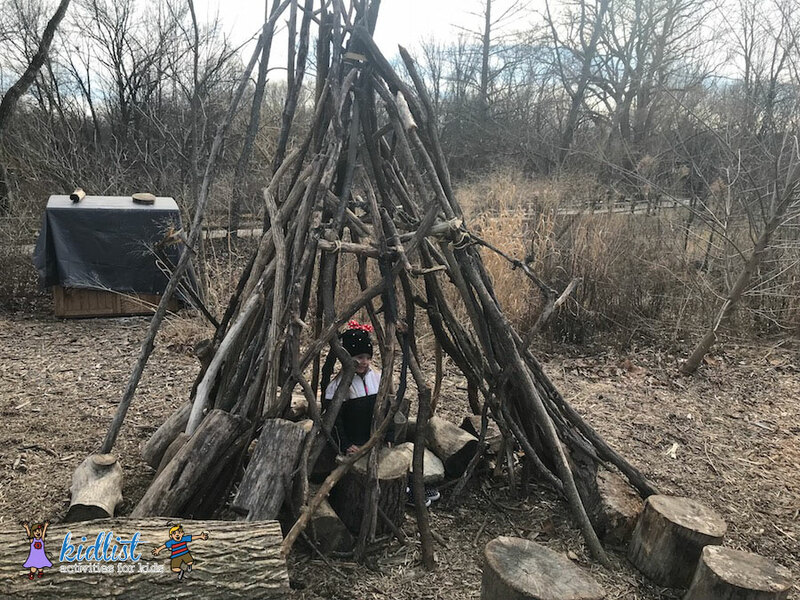 Directly in front of the visitor center, children can climb and play in the stick-constructed tee pee or the stump structure donated by the Boy Scouts. The Little Red Schoolhouse is considered a nature center and therefore no food or drink, outside of water is allowed in the building or trails associated with the center. If you wanted to picnic, you would need to find one or the nearby trails associated with the Cook County Forest Preserve only. The nature center also prohibits bringing pets and animals on site, so please be mindful of that if you are wanting to walk on the trails with your family pet. Bathrooms are available and located in the visitor center. There was a changing table for babies in the woman’s room. The Little Red Schoolhouse is great for people of all ages. Walking the trails and taking in nature is great for any age group. The indoor visiting center is again great for every age, but by about the age of 10 the length of time you could spend in this building will probably decrease. Like most places, the weekends are busier, but the visitor center is large enough that this won’t pose much of a problem, if any. The winter months are generally slower than the summer months. If you are interested, the Little Red Schoolhouse also offers different educational activities typically on Saturdays. Check their website for topics and more information. For more ideas to get your family out in the fresh air, check out our outdoor activities page. 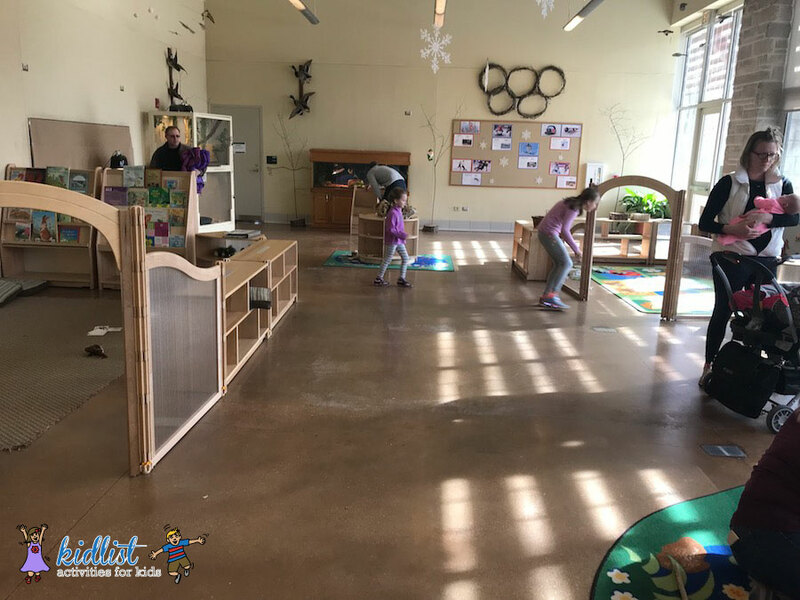 Be the first to comment on "Little Red Schoolhouse Nature Center in Willow Springs"